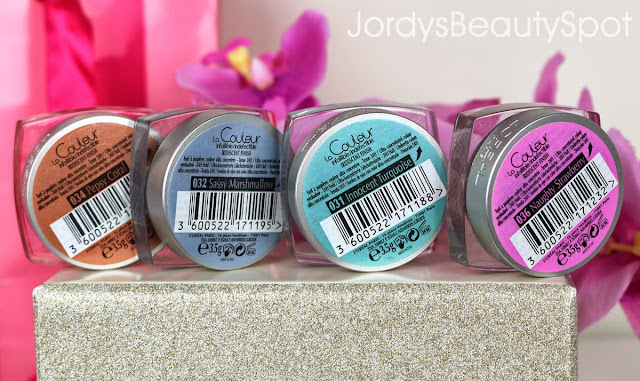 I recently picked up four shades of the L'Oreal Color Infailliable's from Target on clearance for $9 and wanted to share my thoughts on them with you. I have always been interested in trying them out because they look like a fantastic product and at that discounted price I couldn't resist. To me they seem like a hybrid between pigmented and pressed eyeshadow, containing interesting colour combinations and gorgeous practical packaging. Colour Range: The website claims that there are only 8 shades part of this range but I have a feeling that they are referring to the new range currently out and that these four colours I'm reviewing are from a different collection. Either way, there are a lot of different colours to choose from with the Color Infailliable's including a lot of variation between bright colours and more neutral muted tones. Formulation: This isn't your typical eyeshadow, it consists of ultra concentrated colour pigments that are slightly pressed but still somewhat loose. They have a crumbly consistency that works well wet or dry. Packaging: They are packaged in a square plastic tub with a circular screw top lid. Once the lid is opened, there is a piece of plastic protecting the product that once lifted reveals the pressed pigment. Price and Availability: They retail for $19.95 but you can catch them on sale for around $15 or I found them at Target for $9. 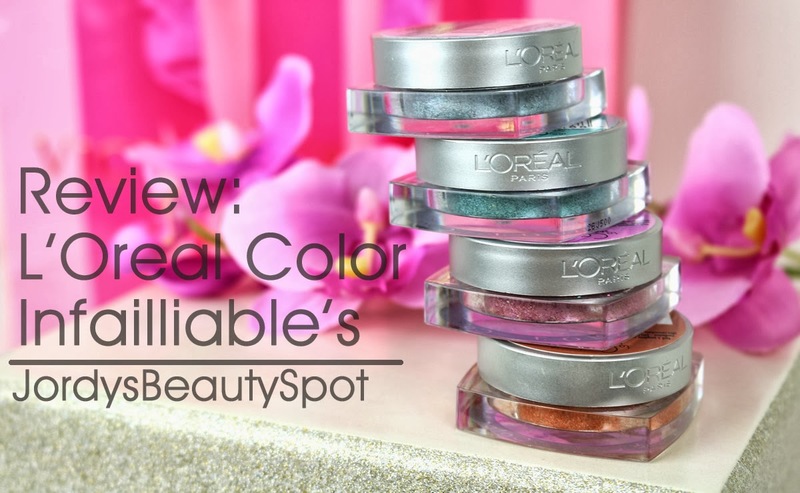 They are available anywhere that L'Oreal is stocked so places such as Priceline, Target, Kmart, Big W and Chemists. Pigmentation: These shadows are surprisingly pigmented, resembling on the eyes what you see in the pot. If you would like to see these products in action, check out my Coral Sunset makeup tutorial here where I use Pepsy Coral in the crease. 034 Pepsy Coral is a bright orange with golden yellow flecks throughout it. 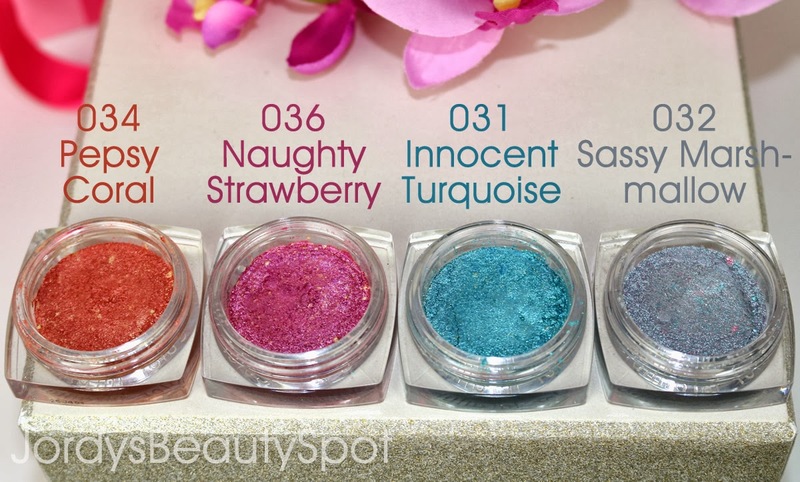 036 Naughty Strawberry is a bold metallic magenta with yellow gold flecks throughout it. 031 Innocent Turquoise is a bright metallic aqua which is one tone of the most part but does contain some yellow gold flecks. 032 Sassy Marshmallow is a cloudy metallic blue-silver colour with baby pink flecks throughout it. My overall thoughts on these L'Oreal Color Infailliable's is that they are an impressive product that are of such high quality I would expect to see at somewhere like Chanel or Bobbi Brown. l'oreal is the best! i love their lipsticks!